Milan fashion week marches on; this weekend, Domenico Dolce and Stefano Gabbana presented a fever dream of ancient Sicily as their Dolce & Gabbana spring 2014 collection. The duo's infatuation with Sicily is documented by the designers' own hands — Sicily's mosaics provided the inspiration for their dazzling fall 2013 collection, and now the pair is looking to the island's interactions with Greece in the days of yore. Not ones to subtly camouflage their inspiration, Dolce & Gabbana hearkened to the Sicily of antiquity by turning photographs of crumbling columns into bold prints, which were repeated throughout the collection. Also featured prominently were almond blossoms — a lovely fluttering embellishment on a sea of organza dresses — and an ancient coin motif, which was cleverly appeared as oversize boxer belts and as a pattern on simple shift dresses. 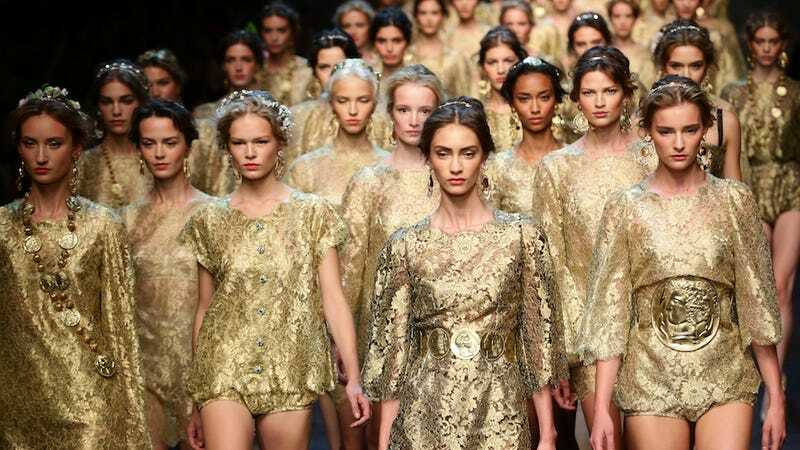 At the end of the show, every model who walked appeared clad completely in gorgeous gold lace. WOMYN POWER.